As most parts of the country received thundery rains yesterday, emergency teams under the Ministry of Municipality and Environment (MME) went into overdrive to ensure that rainwater collected on the roads was drained promptly. 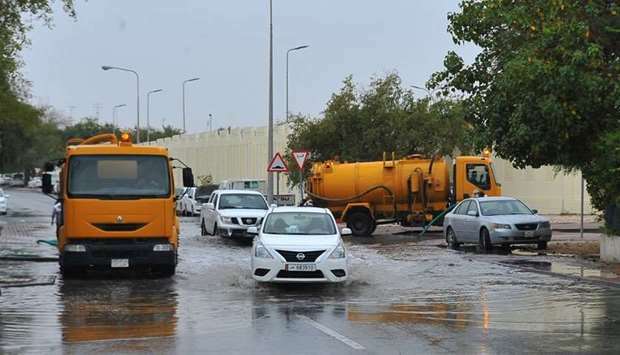 According to a senior official from the Ministry, the teams worked around the clock to remove 12.9 million gallons of rainwater that had accumulated in different places across Qatar. The efforts were made to maintain safe and smooth traffic circulation, reported Gulf Times. Safar Mubarak Al Shafi, director of the General Cleanliness Department at MME and head of the rain emergency committee, said the water was removed in 2,693 batches through the use of 251 tankers and 30 water pumps from Saturday dawn until evening. He said that the teams were equipped with all necessary tools and machines required to remove the collected water and have been working diligently to clear the waterlogging on a priority basis from residential areas and highways to ensure people’s safety. At least 186 calls were made to the control rooms at the municipalities requesting for the removal of accumulated rainwater, Al Shafi said. “The teams rushed to low-lying areas with the beginning of rainfall,” he mentioned adding that the operation is ongoing, according to The Peninsula. Being carried out by MME with the support of all authorities concerned, the efforts are focused on facilitating traffic flow within the country so education institutions, health centers and other organizations remain unaffected, reported Qatar Tribune. Qatar Meteorology Department had shared a weather report yesterday to inform the public of the onset of thundery rains of variable intensity starting in the early morning hours, which resulted in strong winds and high seas. The Department said that it recorded highest rainfall of 20 mm in Al Batna followed by 16.1 in Umm Bab, 15.7mm in Ras Laffan, 15mm in Abu Hamour,13.7mm in Al Ghweriah, 13.1mm in Doha Airport, 8.1mm in Al Ruwais and 7.6mm in Mesaieed . كميات الأمطار المسجلة منذ فجر يوم السبت..
Today will be relatively hot during daytime with some clouds and at some places strong winds are expected while the temperature will be mild by night time. How was your experience with the rain? Let us know in the comments below!